in partnership with the Nigerian Postal Service (NIPOST) and i-OneC (A FinTech Firm) is in line with the Central Bank of Nigeria (CBN) Financial System Strategy (FSS2020) goals to increase Financial Inclusion uptake in Nigeria. 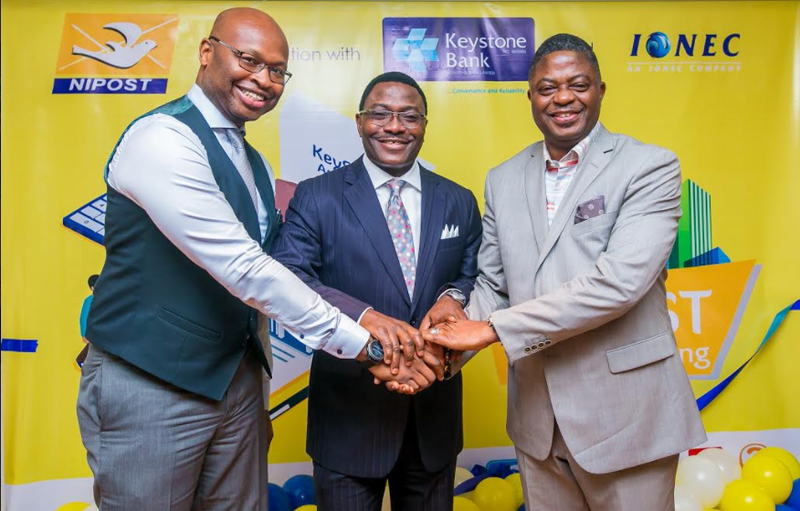 According to the Group Managing Director/ Chief Executive Officer of Keystone Bank Limited Mr. Obeahon Ohiwerei: “Enabling Financial Inclusion is our core area of focus and we have partnered with other industry players to deploy Digital Financial Solutions/ Platforms for improved access to finance; leveraging data to improve the product offerings, personalised & predictive customer service, and uncovering new customer segments”. “One landmark feature of KeyServ (Keystone Agency Banking Services) is that it offers affordable access to financial services than the traditional banking methods” the MD/CEO also reiterated. Also, speaking at the launch, the ED Corporate Banking & South, Keystone Bank, Yemi Odusanya, added that “with this scheme, customers, especially in the rural areas will enjoy unfettered access to banking services. “As at today, we have about 106 approved agents across the country and already, the services are available at Sabongida-Ora (Evbiobe)-Edo State, Sabon Gari (Kano), Mirinjibi (Kaduna), Barnawa (Kaduna), Yaba (Lagos) and Ikoyi (Lagos)”. “Nigerians now have the opportunity to take full advantage of this partnership to enjoy the bouquet of Financial Services across the country.” Odusanya concluded.